A 60-something Baby Boomer's views on politics, pets and life. Mental Floss recently posted a bunch of old ads for the Prodigy internet service on their Facebook page and I took a trip down memory lane by watching them. We bought our first computer in 1990 - it had something like 40 MB of hard disk space and used 5" floppy disks. It was some kind of IBM PC clone and we had debated for awhile whether to buy a Mac or a PC, deciding ultimately to go with the PC because it was cheaper; and even then we shelled out about $2000 for a computer that couldn't hold a candle to the computing power in any of our smartphones. I don't even know what we used that computer for when we first got it - maybe spreadsheets? We weren't early adopter types, like those who used CompuServe in the 80s; we were internet virgins. But then we heard about Prodigy because there were commercials on TV constantly. So we became early subscribers to their internet service. Of course back then we only had dial-up modems to access the internet. But in those DOS-based days, even though Prodigy had a graphical user interface, accessing the service was not a problem since the graphics were so much more primitive back then. 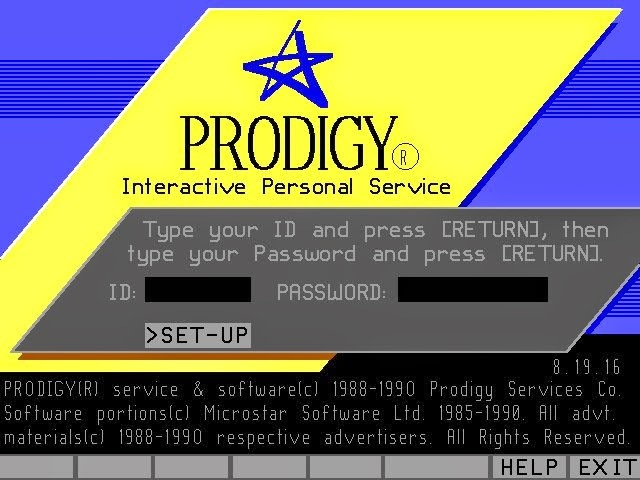 My first non-work email address was through Prodigy, and my first online shopping experiences were through Prodigy. From the beginning I saw the advantage of shopping online - and now I do almost all of my shopping that way, even for groceries! But it was thanks to Prodigy that I first got hooked on it. I remember getting up every morning during the first Iraq war and getting online to see the latest headlines from the night before. It was through Prodigy that I started to be addicted to getting the latest news without waiting for a newspaper. My favorite aspect of the service was their message boards, which they called bulletin boards. They were organized by topic and subtopic. So, for instance, there was a Pets topic, a Dogs subtopic, and then individual subjects under that. You could either create your own heading or get involved in a discussion under another heading, such as, in my case, Pit Bulls. In 1995 we had just adopted a pittie mix, our dog Alice, from the local shelter, and I got into discussions with other lovers of the breed on that bulletin board. We had a great community there and I got to know one of the members well enough that we started exchanging snail mail Christmas cards each year. She lived in Fresno, California. Unfortunately, we eventually lost touch. I am hoping she and her husband and pets are still doing well. By the mid-90s AOL was overtaking Prodigy as the more popular service, but I never liked their format. I tried their service a few times, using one of the free floppy disks they sent to our house, but ended up sticking with Prodigy. However, as time went by, we eventually dropped Prodigy because the costs were going up - and by then there were so many other ways to access the Internet. We tried Juno for awhile, and then Earthlink, all still using dial-up. Then we finally succumbed and got Comcast cable, which gave us high speed internet access as well as cable television. Believe it or not, we did not have cable TV until then. By this time - maybe it was 1999 or so? - the Internet was much more established. I was in touch with many old friends through email and went on various forums from time to time, but I missed the interaction with other people that I got in a more organized format. In the early 2000s I found that kind of interaction on the online forums on our New Jersey site, NJ.com. There were forums about our town of Bloomfield, for our county - Essex - and for various subjects, including religion, politics, and pets. Once again I found myself part of a community of likeminded (or not so likeminded) people, and delved into deep conversations with people I had never met. We all had "handles" to disguise our real identities. I went with Uhuru, which means "freedom" in Swahili. Uhura from Star Trek was also based on the word, which is where I got the idea, but I just took the generic Swahili word without the feminized ending, just to be more mysterious. I used to get into heated arguments with a poster named Greylady, who rescued greyhounds but was not a fan of pit bulls. We used to argue incessantly about the issue of breed-specific legislation, in which certain breeds of dogs, particularly pit bulls, are restricted or banned. Then came blogging. In 2006 I started hearing more and more about blogs, and found out that a neighbor of mine at the time was a blogger - a well-known and prolific blogger. She wrote about her family, her son, her dog and many other subjects. Some of her posts would make you laugh; others would make you cry. She has since become a published writer and she teamed up with another blogger and wrote a whole book. At that time I was simply impressed that she actually had a blog; it seemed so interesting and trendy. I thought to myself, hmmm. I wonder if I could do that? My inspiration came after writing a long post on our hyperlocal news site, Baristanet - yet another location where people exchange comments and opinions. I had posted, along with others, an account of where I was on 9/11, on the fifth anniversary of the attack. I figured, here I had my first blog post all ready to go. So I got on Blogger and started this blog, and plonked down the remembrance of 9/11 as my first post. I was glad I named the blog Mauigirl's Meanderings, because after that I had no idea what to write about. I meandered.... a lot. I was nervous about actually speaking my mind and having people who know me figure out who Mauigirl was and know what my thoughts were about various subjects, especially if they were people from work. In the early days I made a few blog friends - one of the first was my friend Ruth from England, who wrote the blog Me, My Life, My Garden. A few others joined in commenting on my blog, but not as many as would eventually become part of my little circle of blog friends. 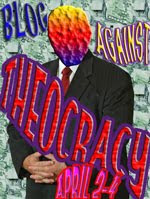 Finally came the first Blog Against Theocracy event and I decided to participate for the first time in 2007. 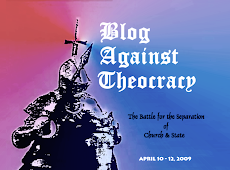 I wrote a fairly scathing post about the evils of mixing religion and politics (sadly in some ways even more pertinent now than it was then), and after that the gloves were off. Although I still write about anything I feel like writing about, and I still meander, I have long since given up the idea of keeping my liberal politics - or my real name - a secret. 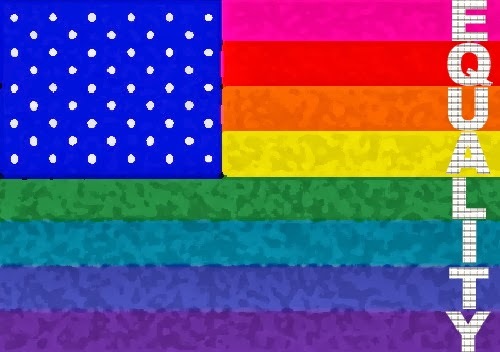 I met a lot of great blog friends in the liberal blogging community and am happy that many are still commenting even after all my gaps in posting here. Then in 2008, I joined Facebook. A friend of mine had joined and said 'You have to join, it's perfect for us - it gives instant gratification!" Sure enough, I became hooked. I ended up being Facebook friends with many of my blog friends, and then friends of theirs, and friends of their friends... At the same time I got to know a lot of people in my own community, some of whom I'd met in person and some not; and on top of that I got back in touch with childhood friends I hadn't been in contact with for, in one case, 40 years! Looking back, I see my online involvement has been most focused on finding a community or number of communities in which to exchange ideas, find likeminded people who are interested in the same things I am, and keep in touch with distant friends and even relatives. Facebook is the ultimate when it comes to this function. I love reading blog posts and making the effort to write well-thought-out posts of my own, for when I want to do some serious thinking, or even not so serious thinking. But in terms of carrying on a conversation and providing the opportunity for give-and-take that builds a relationship, I find Facebook to be a great resource. My Facebook friends tend to post links to thought-provoking and informative articles that I might not have ever read otherwise. They post points of view that invite intelligent discussion. We commiserate on one another's losses and share in our successes. Some people complain that their Facebook feeds are full of silly things and are a waste of time - I am happy that is not the case with mine. Don't get me wrong, I love a good joke or meme as much as the next person, and my friends and I are certainly guilty of posting pictures of our dinners from time to time. But I like seeing people's dinners! They inspire me to want to cook something good for my own dinner! Often a post like that leads to a request for a recipe, or a restaurant recommendation. So it's all good. So many people criticize Facebook and other means of online communication as leading to people being more lonely and less social than when they were confined to interacting "in real life." I disagree. Between blogging and Facebook, although I am often by myself at home now that I retired from the Big Corporation, I am never lonely. I can always find someone out there who is online at the same time I am and we can talk. Some of the people I talk to may not be people I know "in real life," but I feel I know them nonetheless and they are no less "real" than other friends. When you think about it, ever since people went online, what they have always been looking for is what is now called "social networking." So, looking back on how it all started, in my own case, I have to thank Prodigy for having sucked me into the world of the Internet and changing my life forever. 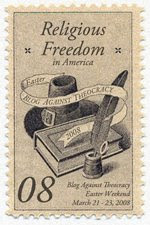 For others it may have been one of the earlier services, or a slightly later one like America Online. But in the end, we were all looking for the same thing. Connectivity with other human beings. Loved this post, Mimi. It was a trip down memory lane for me--although we never signed up with Prodigy. We were early to the computer world, getting our first one in 198--a Texas Instruments 99 A. Our second computer was an Apple IIC. And thereafter, variations of PCs. I also enjoyed your observations on blogging--the anonymity we adopted early on, using pseudonyms. Mine stil works for me--the K is for my daughter's name, the G for my son's, and of course the mom part is obvious. I still like blogging for depth and analysis. On Facebook I try not to be too pointed, as I have many relatives who no doubt think I am consigned to hell--not something I worry about. I enjoy your blog postings AND your Facebook comments. Oops--our first computer was acquired in 1984. Somehow the 4 dropped off my earlier comment. Thanks KGMom! I always enjoy your posts in both locations as well. I agree, blogging is still the best way for the in-depth discussions. I have to drag myself away from Facebook to write on a more in-depth subject from time to time - it has to be something that really piques my interest these days - and something not everyone is writing about because I'm just not quick enough on the draw to post a long serious blog post about breaking news - everyone would beat me to it, LOL! It is amazing how far we've come since the 80s. You were ahead of us on the computers although in the 80s I was using a computer at work at least. As I recall it was probably an IBM 86 or whatever that early one was, with the two floppy disks you had to insert! Sorry for the late response - we were away last week! Very good information, Thank you so much for the nice post. I don't live in Maui but do love to visit there. I live in New Jersey and am retired, after working for what I fondly call the Big Corporation for almost 31 years in market research. Now I keep busy by serving on my local Historic Preservation Commission and the local Animal Shelter Advisory Committee, among other volunteer positions. I am married (to my Dear Husband, also known as DH), who also recently retired, and we have 2 rescued pit bull terriers, one named Diva and one named Angel. I'm a die-hard liberal from way back, and follow politics pretty closely. However, although I am a liberal, I am also practical and am a firm believer that "The perfect is the enemy of the good." I am also a Facebook addict and love meeting people from all over and having stimulating conversations. It all started with blogging and now many of my blogger friends are Facebook friends too! Biden’s Accusers: #MeToo or Just After Their 15 Minutes? Fear and Loathing this Election Cycle! How high's the water momma? OMYWORD! Did I Say That? Will You Be My Dox-entine? To Good to Check: Guess Where Alien Hunters Think They’ve Found a UFO?